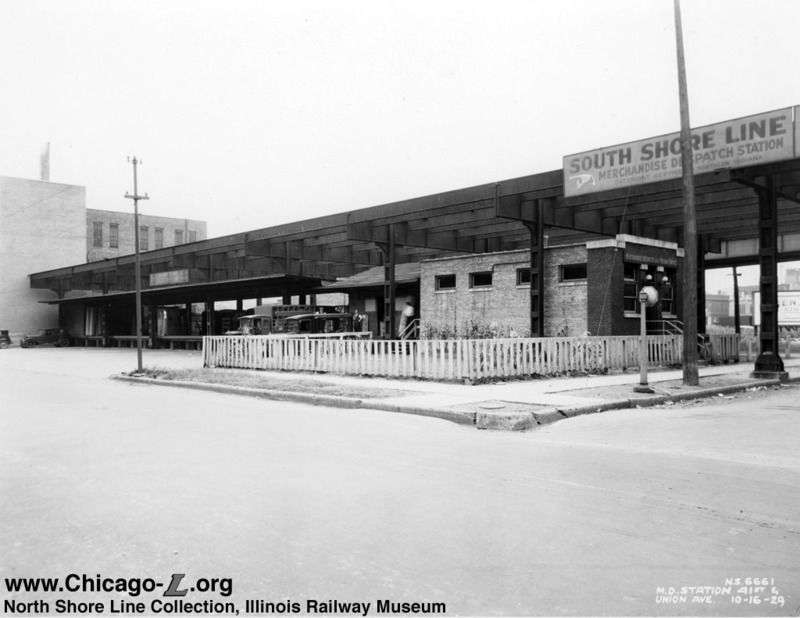 On April 8, 1908, the Stock Yards branch of the South Side Elevated opened between Indiana station and the famous Stockyards. As the branch headed west from Indiana, it made a zigzag south just west of Union Avenue for a little more than a block before turning west again toward the yards. At the west end in the Stockyards, the branch ended in a single track loop around the "Packingtown" section of the yard, where most of the companies had their meat packing plants. 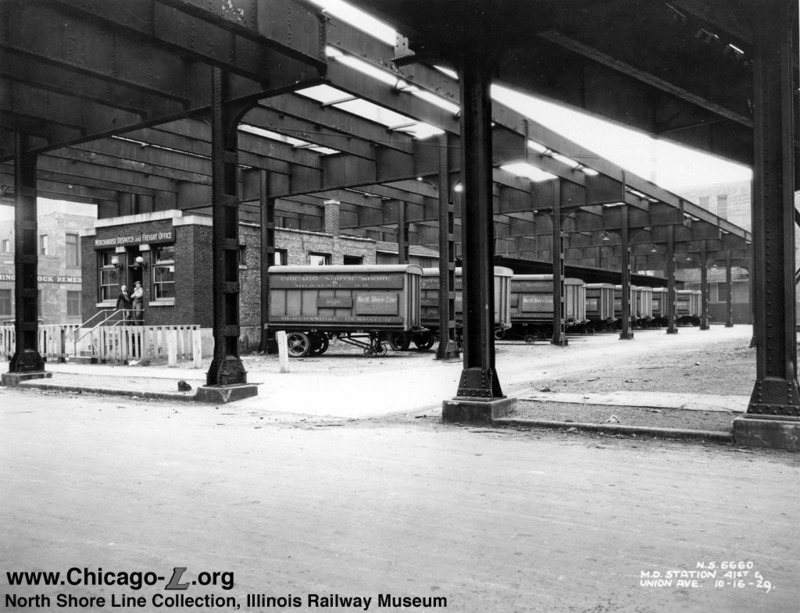 More than a pit, the Union Avenue Yard actually had a one-track inspection shop built on the easternmost track in the yard. Perhaps this building was the "trainmen's house" mentioned in the article. However, the whole endeavour appears to have been unnecessary -- there is no record that the Union Avenue yard or shop was used on a regular basis. By 1913, a company training manual for trainmen related to through-routing of trains noted that the interlocking plant controlling access to the yard from the main line tracks of the Stock Yards branch was not in operation and the arms on the signals had been removed. This suggests most likely that the yard was not in service, or at the very least that it was used so infrequently that moves were handled by manually throwing switches. A 1919 valuation report from the Illinois Public Utilities Commission stated that, by that point, the tracks in the yard had already been removed, showing that the yard had been completely removed from service some time prior. 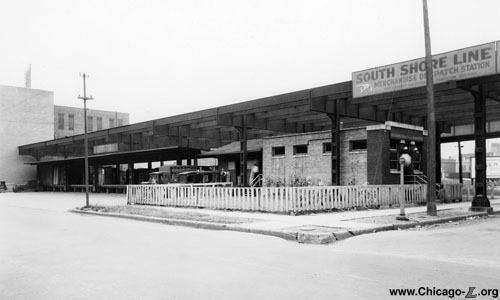 Interestingly, the Union Avenue Yard was built with both a larger capacity and an inspection shop compared to the 50-car shop-less yard built at 42nd Place on the Kenwood branch, whose facilities were actually used. The North Shore Line abandoned LCL merchandise dispatch service in 1947, although the 41st and Union facility may have actually been closed before that time as North Shore Line company documents discussing abandonment of the service in 1938 did not list 41st & Union as an LCL facility. Some or all of the steel elevated structure was dismantled and salvaged for a scrap drive for metal during World War II. Any remaining elevated structure was subsequently demolished, although some column footings and bases survived into the 1990s. The small brick building that housed the merchandise dispatch and freight office was left, however, and was still standing as of 2014, housing an electrical supply company. 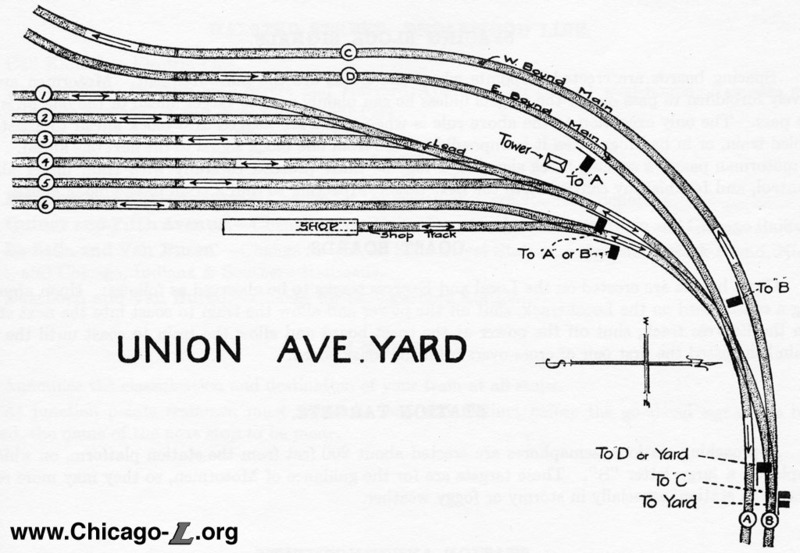 1913 - Union Ave Yard track map (163k): From Instructions to Trainmen in Connection with Through Routing: "The Interlocking Plant at Union Avenue governs the route to and from the yard to either main line track. At present this plant is not in operation, the arms on the main line target having been removed."